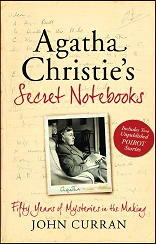 » A Review by Ray O’Leary: JOHN CURRAN – Agatha Christie’s Secret Notebooks. A Review by Ray O’Leary: JOHN CURRAN – Agatha Christie’s Secret Notebooks. JOHN CURRAN – Agatha Christie’s Secret Notebooks. HarperCollins, hardcover, September 2009. Since John Curran is the literary adviser to the Agatha Christie estate he was allowed to enter the two locked rooms of her house after it was donated to the National Trust and opened to tourists. The two rooms mostly contained copies and first editions of her various novels, story collections and plays but in the smaller room, on the bottom shelf of a bookcase, he found a cardboard box containing notebooks in which Christie jotted down various story ideas and preliminary plotting for most of her novels, stories and plays. These notebooks were in no manner orderly; when Christie had an idea she grabbed a notebook at random and jotted it down on the first blank page available. So notes for various of her works are scattered, most of them in more than one notebook and the numbers on them mean nothing as to when she made her entries. Also, despite what is printed on the dust jacket, none of the notebooks contains any of the plot ideas for The Murder of Roger Ackroyd nor Murder on the Orient Express and a few others of her works. (He never discusses Witness for the Prosecution, play or story, so I’m presuming that might be another.) The notes for those works presumably are lost. What is here is an abundance of ideas used and rejected for most of the things Christie wrote. Sleeping Murder‘s original title was going to be Cover Her Face, but it was changed after P. D. James used that title. 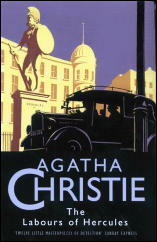 The two major finds, however, are unpublished short stories featuring Hercule Poirot, which are printed at the end of his commentary. The first story was “The Capture Of Cerberus” the 12th Labor Of Hercules. From November, 1939 through most of 1940 the first 11 Labors had been published by the Strand Magazine. It wasn’t until 1947 that she wrote the 12th story which completed the Labors and made possible the collection of that title. This original story was unsuitable for pretty obvious reasons: It features a character clearly based on Adolf Hitler and portrays him in a favorable light since, in this story, he has a change of heart and becomes a proponent of World Peace, which would have been pretty hard to swallow with bombs falling on London. And though Curran doesn’t say so it in his notes, a plot device turns up that was used in Hitchcock’s 1940 film Foreign Correspondent: the kidnapping of a political figure and his replacement by a double who is then assassinated. The other story is called “The Incident Of The Dog’s Ball.” This is much better, but was never offered for publication because it is a 20 page version of what was to become the novel Dumb Witness (Poirot Loses a Client). Christie must have realized she could easily turn it into a novel so never sent it to her agent. Finally, if you haven’t read a lot of Agatha Christie’s output and are planning to, be warned: before every chapter Curran states which novels and stories will have their solutions revealed in his discussion. I finished Christie’s detective novels and stories and some of her plays (she wrote 20) a long time ago so that didn’t bother me. For those who haven’t, you might put off reading this until after you have. Also, Curran uses the politically incorrect (racist) original title for And Then There Were None when talking about that book. I’ve been thinking of buying this one, and it sounds well worth it. It’s always interesting to see the ideas a writer rejects or chooses especially if you have read the book in question. In Christie’s case maybe it will give us enough insight to beat her to the punch just once — though I doubt it. They had copies in Borders the last time I was there, so I had a chance to look through it. You have to know the stories before you really can take advantage of all of the info about them that Curran provides. Even if not all of the novels and stories are covered, it’s a sensory overload of a book. I’ll probably wait until I have a 30% discount coupon before buying it, or wait for a paperback edition comes out, which I _hope_ will be the case.